The Cape follows Vince Faraday (David Lyons), an honest cop who finds himself framed for a series of murders and presumed dead. Fueled by a desire to reunite with his family (Jennifer Ferrin and Ryan Wynott) and to battle the criminal forces that have overtaken their city, Vince becomes “The Cape” — a vigilante and his son’s favorite comic book superhero. Others in the cast include James Frain, Keith David, Summer Glau, Dorian Missick, Martin Klebba, and Vinnie Jones. The NBC series struggled to get good ratings and is one of the lowest-rated scripted serieson the network. Though it hasn’t been officially cancelled yet, The Cape is very unlikely to be renewed for a second season. The series’ showrunner has already moved on. 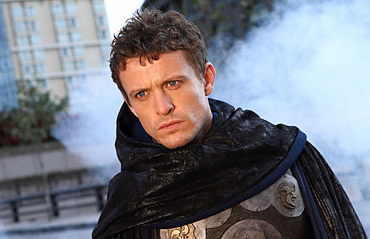 THE CAPE AND VINCE FARRADAY’S WORLDS COLLIDE AND HARD TRUTHS ARE REVEALED — Police Chief Marty Voyt (Dorian Missick) lands behind bars, in the hands of ARK Corporation, fearing he may receive the same fate as Vince (David Lyons). Attempting to learn more about Vince’s disappearance, Dana (Jennifer Ferrin) takes on Marty’s case, and the impervious ARK Corporation, only to discover secrets of betrayal. The Cape’s double identity becomes blurred when Max (Keith David) and the carnival of crime attempt to protect Dana, Marty and his family. What do you think? Does this satisfy you? Is this a good way to end the series? Why do you think The Cape didn’t catch on? Here I am years later re-watching The Cape on net-flix and getting angry all over again at the pulled plug. I watched Iron Fist recently and aaaggghhh! But the networks gave it a chance. Why not the cape? We are now in an age of super heroes from Marvel to DC. Maybe it’s time NBC, what do you say? Bring Cape Back? I only found out about the show on Netflix .I believe with all of the networks ,good quality entertainment like this gets lost and people never get a chance to find out what types of entertainment are out there .this is one that certainly could have been a great hit if people only knew about it ! Although I feel the endgame’s episode was good it certainly did not conclude the series well. Through the whole season I was waiting to see how The Cape gets back to his family and is happy, because that what all shows are right? BUT NO, I’m left extremly frustrated, knowing that watching the whole season was a huge waste of time! Thanks a lot NBC. Watching a good series on NBC is no longer possible. This tv station does not deserve any loyal fans whatsoever. The worst station of all. Summer’s problem is simply she has been typecast as a “sci-fi genre goddess”, so she gets offered sci-fi shows. And she likes sci-fi so she takes them. But sci-fi on BROADCAST networks rarely work. She should do sci-fi only on CABLE networks where they have a better chance to survive. She should also switch out from sci-fi to an action show or drama for her next choice. Something like the role Gabrielle Anwar has on Burn Notice would be perfect. Not a good way to end the series. I was afraid it would flop, and this was the result I was afraid of, though prepared for. None of it was fair. This ending does not do the series justice – it should not have been cancelled! !